Hey, the original recipe actually calls itself a salad, so I’m just going with the flow. I turned Strawberry Pretzel Salad into an easy, fast, and delicious DIP recipe! Somehow we entered a time warp back in January and when we stepped out it was mid-May. I’m not quite sure how that happened but Memorial Day is right around the corner. After that, summer and with it pool parties, BBQs, the 4th of July…all times when you need lots of potluck ready appetizers and desserts that are no-bake, easy, and fast. 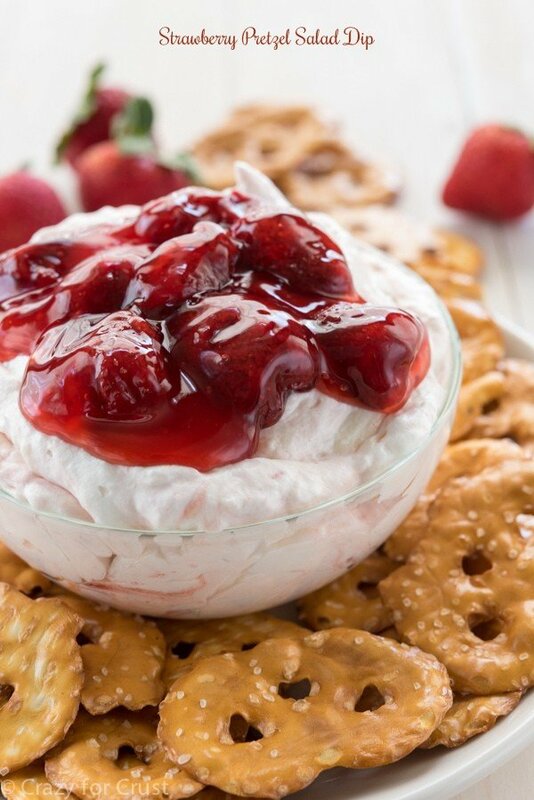 This Strawberry Pretzel Salad Dip fits all of those requirements. Especially the one where it’s good for a party. It’s perfect for a backyard BBQ, a potluck…or a baby shower. It’s even good for a virtual baby shower. Today I am so happy to be throwing a virtual baby shower for my blogging BFF Ashton from Something Swanky. You guys all know how much I love that girl. She was my first blogging friend who quickly transitioned to real-life friend. Ashton is having a baby boy next month. And I (and some of my friends) are so excited for her that we’re throwing her a virtual baby shower! 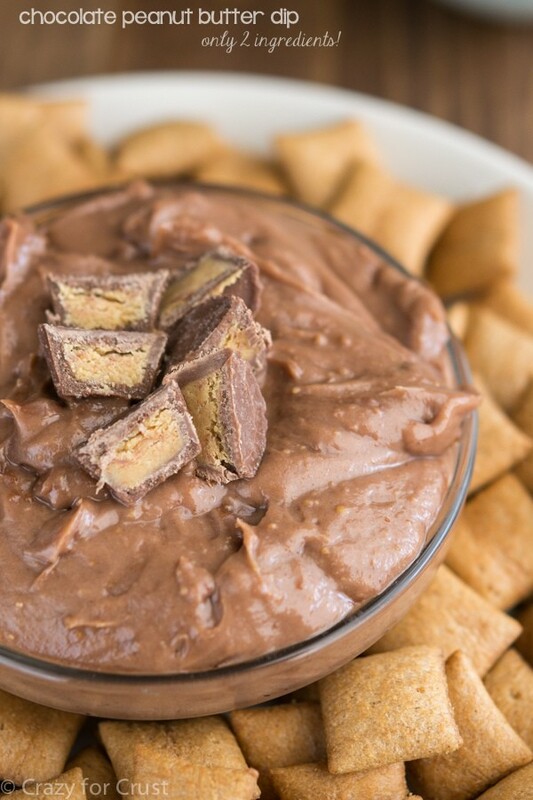 As soon as I started planning this shower I knew I had to make a sweet dip recipe. Ashton is the one that got me started on those, with her recipes like Brownie Batter Dip, Cannoli Dip, and various cake batter dips. She also loves fluff recipes, so when I was brainstorming easy, fun, and fast dip recipes made out of summer flavors I immediately thought of the Strawberry Pretzel Salad recipe that’s been begging me to make it for years. YEARS. That’s how long this dip has been waiting for me. I daresay, the actual salad recipe is pretty easy but this dip? Is even easier. Just a few simple ingredients get mixed together and it’s ready to serve. The classic Strawberry Pretzel Salad recipe includes cream cheese, whipped topping, and sugar. Then it’s topped with strawberries and jell-o and it’s all on top of a pretzel crust. This recipe is very similar. The base of the dip is the same as the middle of that layered dessert. 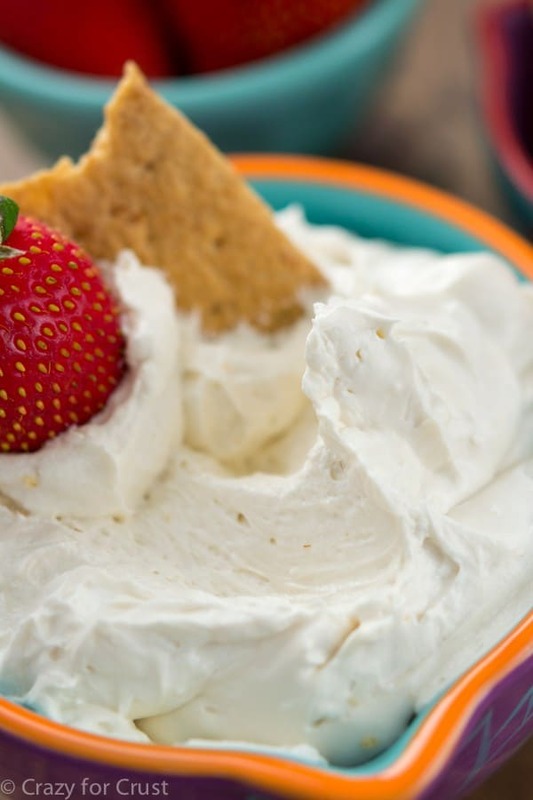 Cream cheese, sugar, and whipped topping are mixed together (you could substitute whipped cream). Then, instead of using jell-o, I used strawberry pie filling. Just swirl some in and add some to the top for garnish. Instead of making crust, you just serve this with pretzels. Or a spoon. I won’t judge. It’s perfect for any gathering because it’s no-bake, easy, and fast. And it’s pretty, so it’s perfect for a baby shower! 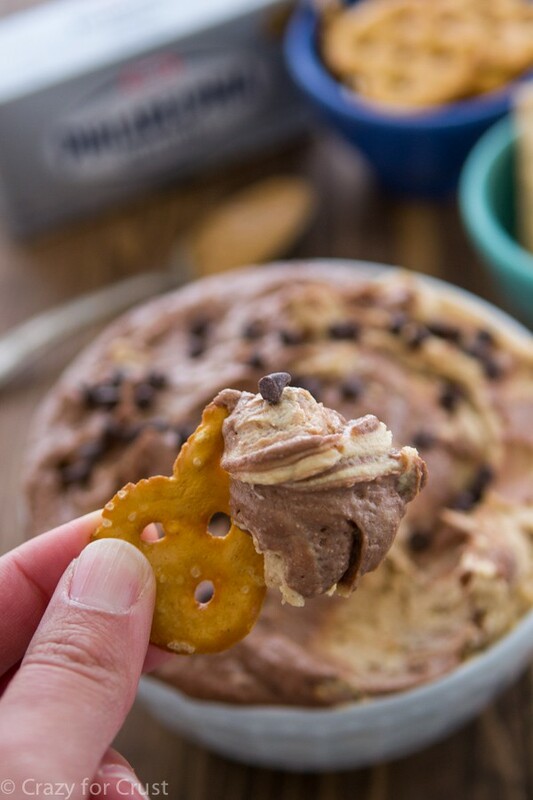 Turn your favorite summer recipe into a party dip! 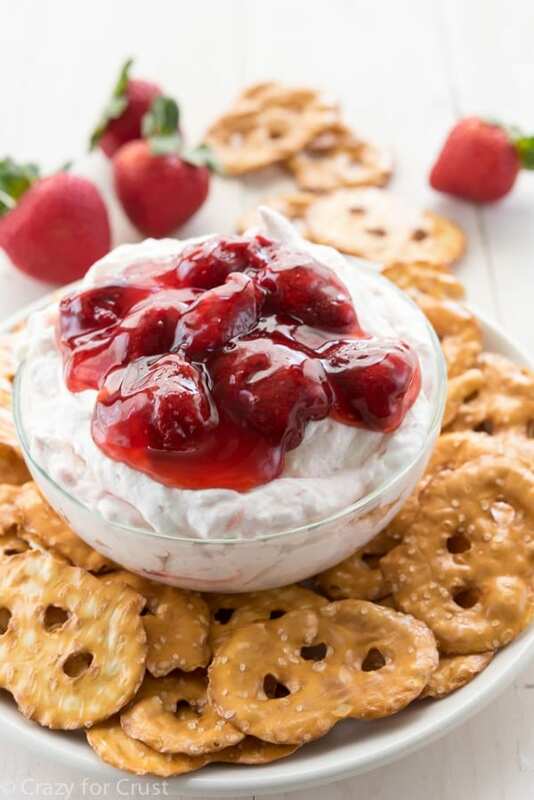 Strawberry Pretzel Salad Dip is just like that no bake dessert but easier to serve! When ready to serve: Place dip in serving bowl. Top with another 1/4 cup or so of pie filling for garnish. Serve with pretzels. Genius! This is amazing! I have got to make this ASAP! I love this dip! So creative! Will definitely be making! This dip looks amazing, Dorothy! I love that you transformed a classic salad into a fabulous new recipe 🙂 You’re a genius! This is such a fun a creative dip recipe! Love it!!! This dip looks amazing! I am definitely trying this out! We’ve kind of got a corner on the strawberry-pretzel salad market this week, huh? This looks absolutely delicious-I love dips more than life itself. Pinned! I didn’t have any strawberry on hand, but the dip was excellent with blackberry! I could eat it right off the spoon. Yum! This looks so amazing! I LOVE pretzel salad but can never get the jello to set properly. can’t wait to try it! PS.. I MAY love your jams even more than the dip. The strawberry pretzel dip was absolutely delicious. Had it at family dinner and everyone loved it. My husband ate it off his plate with a spoon, no pretzels needed! Thanks for a great recipe. That depends on a lot of factors, but anywhere from 4-8 depending on what else you’re serving.